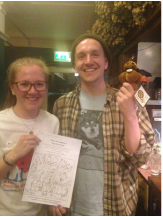 As part of Life Festival, some of our PhD students took over three rounds of the weekly pub quiz at The York (Broomhill) and Porter Cottage (Sharrow Vale Road). The questions tested the quizzers knowledge of antimicrobial resistance, Sheffield’s infectious history and how much they knew about infectious diseases and treatments. It was a fun night, with the lucky winners going home with a cuddly superbug!